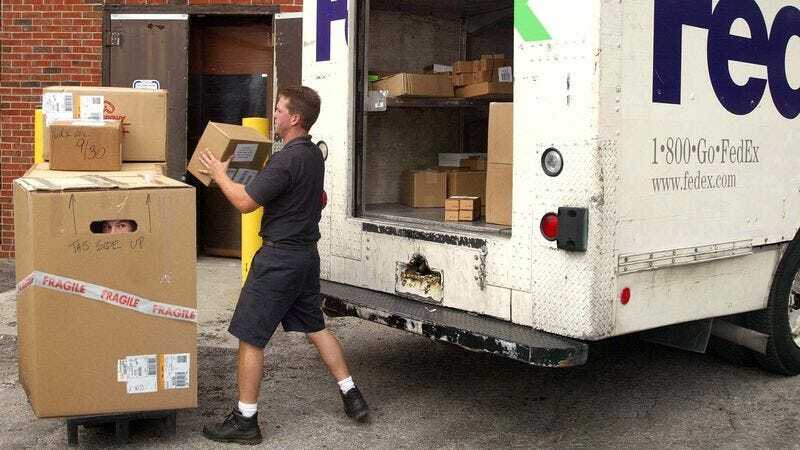 FedEx employees are reportedly taught to look for signs of people mailing themselves, such as boxes that move on their own or cough. MEMPHIS, TN—Saying that the number has been gradually rising over time, officials at global delivery services company FedEx confirmed Thursday that some 600,000 people seal themselves up in shipping containers and try to mail themselves every year. A FedEx spokesperson told reporters that, in the past year alone, the company documented well over half a million incidents in which employees discovered individuals crouched inside oversized cardboard boxes that were either left waiting outside homes or had mysteriously arrived at the doors of FedEx retail locations with completed shipping labels. Since the company was founded in 1971, FedEx has reportedly dealt with increasingly elaborate attempts from people looking to mail themselves cross-country, with roughly 300,000 individuals per year contorting their bodies in cramped containers or shimmying into large cardboard shipping tubes to take advantage of affordable rates on delivery within three to five business days. In addition, FedEx workers are also said to annually come across 150,000 packages containing people who paint their skin to look like statues and keep perfectly still to avoid detection. Moreover, FedEx officials admitted they deal with some 750 misguided individuals each year who do nothing more than affix a mailing label to their bellies and expect to be shipped to their requested destination. With the recent uptick in self-mailing incidents, FedEx has reportedly already taken steps to curb the number of attempted human shipments. According to company officials, all employees are trained to look more closely for postal boxes that seem to have moved on their own at any point, contain two eyeholes cut into the cardboard, or emit loud cell phone ringtones. Nichols noted that, on average, each individual FedEx store has to deal with a handful of individuals attempting to mail themselves every day. Furthermore, he said that it is not uncommon for shipping clerks to spot entire families stacked up in separate boxes trying to be mailed together. According to FedEx rules and regulations, the company maintains a strict policy of not mailing human beings. Despite the company’s expanded efforts to dissuade self-shipping, numerous FedEx customers have announced their intention to ignore the rules and continue their endeavors to mail themselves. “Shh, be quiet—I think I hear them coming,” he added.